There he did the Supplication Service to the Panagia. The villagers had become afraid and the small children were panic struck. Everyone prayed and did prostrations. The "prophecies" of this woman, concerning impending destruction, had shaken up the village. 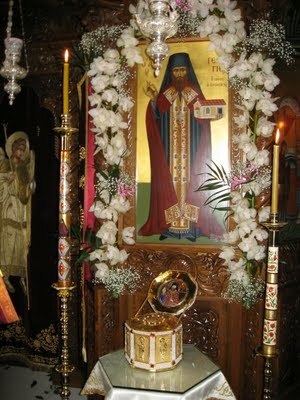 The Elder quietly and calmly prayed at the Holy Altar intensely and fervently. Towards the end of the Supplication Service many people heard a loud noise. The woman was immediately freed from the wicked spirit, which had overcome her and told her the dreadful signs which she mentioned. The Elder said: "Thanks to the praying babes the woman was healed, or the devil would have thrown her either in water or in fire."